I think I just discovered my new favorite snack. Look at these adorable Frozen Yogurt Cups! How is it that just when I think there can’t possibly be any more great new food ideas, I come across another wonderful new way to make something delicious and fun? I love how many wonderful ways we can enjoy real food. I am one of the biggest food geeks. Nobody loves food as much as I. Except for maybe you, which is why you and I have so much fun together here. Isn’t food so very much fun!?!?!!!!!! At the very least, we all love to eat. It’s just that some of us like to also gawk at our groceries, get a thrill out of creating fun menus, and dream daily of new recipe ideas. Occasionally we might tear up when we look at the full shelves in our beautiful pantry. Some of us. All this excitement over little frozen yogurt cups. Hey. You have no idea. I saw this idea and loved it, but I didn’t know that I would love it, love it. But the easiness of this idea! The endless options of what can be done to create variations that every family member will like! The deliciousness. 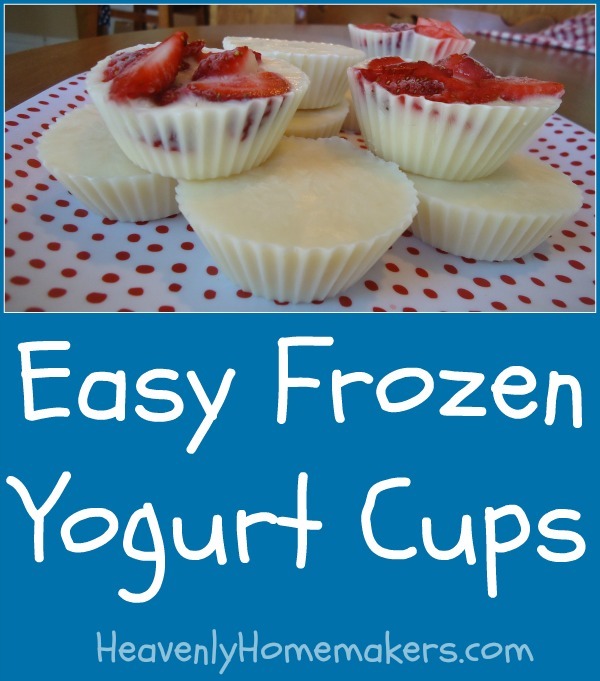 Because making Frozen Yogurt Cups is so very easy, this would be a great “recipe” to hand over to your kids to make. Everyone can create these with their favorite goodies (granola, berries, nuts, peanut butter, chocolate chips…). It’s easy to make yogurt: learn more here. Toppings like fresh berries or peaches, granola, chocolate chips, etc. Stir together yogurt, sweetener, and vanilla until well combined. Scoop 2-3 Tablespoons of yogurt mixture into prepared muffin cups. Top with fruit if you like. Freeze for 1-2 hours until solid. Transfer leftovers to a freezer bag and pull out for snacking as needed. 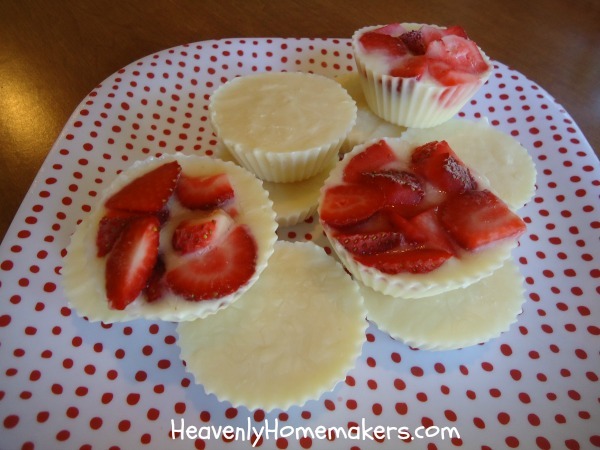 1) These worked wonderfully in my Silicone Baking Cups. They popped right out once frozen and clean up was so simple! 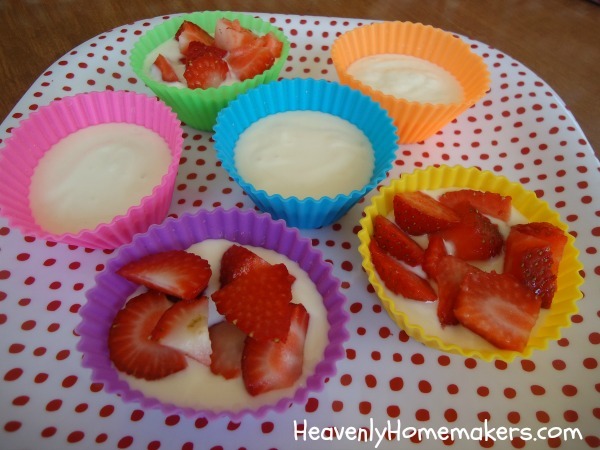 2) You can use your Frozen Yogurt Cups to make smoothies! I mean, frozen yogurt and berries? This is what smoothies are made of. Throw some Frozen Yogurt Cups into a blender with a little milk and you’re set! What a great idea!!! Maybe adding peanut butter and sprinkling w/ choc chips? Not quite as healthy, but not terrible either. I do get super excited when I can save money when buying groceries and I see the savings at the bottom of my receipt! I especially like it when I can “double dip” and use a store coupon with a newspaper ad one! That brings me joy! Have a wonderful weekend! I’ll be at baseball, and I’m guessing you’ll be at soccer. Fun fun fun!! !